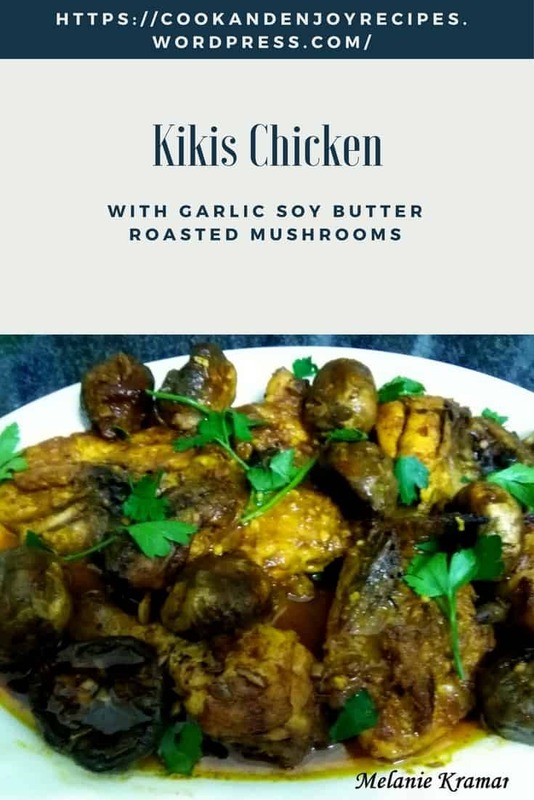 After all the ravings about Jameela Sayed’s Kikis Chicken, it would’ve been totally remiss of me not to try it out for myself. Well, true to form it was excellent. I also made Garlic Soya Butter Roasted Mushrooms which is featured with the chicken. Make a paste with the above ingredients besides butter and marinate chicken for half an hour. Preheat oven to 180 degrees C. Line a baking sheet with foil. Place chicken on baking sheet and cover with foil. Bake in oven 180C for 40 min on the bottom shelf. Remove foil and brush melted butter and marinade mixture over chicken and place rack on centre shelf. Change heat setting to grill and grill for five minutes on both sides basting in between. Serve with fresh rolls and salad. Place mushrooms, stem side down in a dish, sprinkle salt, smoked paprika, onion powder. Add butter and drizzle soya sauce over.